It is a very odd plan – the Brick House. A set of curved walls creates a fluid enclosure at the center of which stands a tree in a court. Composed of oxide floors, brick and stone walls, free-standing timber columns, timber and split-bamboo ceilings and a set of warped ferro-cement roofs; the house has a very organic plan that defines spaces through small gestures – walls, openings, pivots, change in levels and textures. PLAN of the Brick House with its spaces enclosed by organic, curved walls. 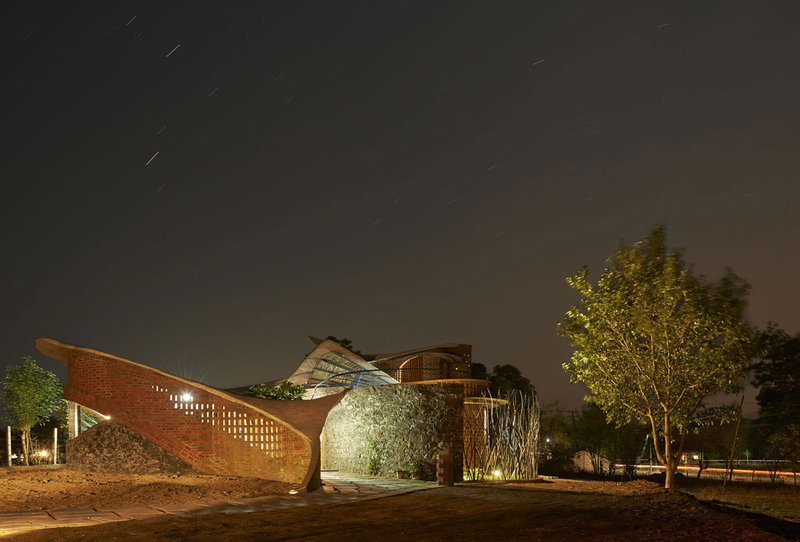 Designed for a client who wanted the house to be a simple enclosure made of bricks, the architecture is readably inspired by the works of Nari Gandhi. The spaces within are defined by a set of curved walls – each enclosing and opening to a space. These walls are composed in a contrasting set of materials. Brick and stone are used in multiple forms and details to create the changing surface articulations. Further to the walls, the enclosures are defined by levels and variations in surfaces. Patterns and textures change with spaces in turn rendering a definite ambience to each space. Complex openings are resolved in steel and wood. It was a significant challenge to secure the building, something that the architects have achieved by keeping the scheme permeable to light and breeze. View of the entrance movement. Brick walls, oxide floors, timber supports to ferrocement roofs, stone flight. Reflections in the water-body central to the plan. The flight of the staircase to the upper level – an element in stone. The roof of the building is a unique composition. Built mostly by using ferrocement in conjunction with bamboo, parts of the roof have been cast as filler slab (in-situ) with earthen pots occupying the filler space. The seemingly amorphous roof sits lightly on the structure. Detailing was a significant challenge in this project. Many ideas were explored on site and complex conflicts like fenestrations, movements and connections were resolved through changes in materials and textures. At some places, heavy timber logs take the weight of the roof while in instances; the load is taken by a twisting brick column. Walls are made in Laurie Bakers’ rat-trap bond – one of the rare instances where walls in this bond are curved. While the living and kitchen are composed of a continuously curving wall around a court, the two bedrooms are scooped out of the plan and separated by complementing walls. The fluid space of the living area. Bedroom with a built-in bed. Walls, openings, windows and concrete ledges. Articulation of forms – the corner opening and louvers that ventilate the bath. The mirror – set in the curve. Articulation of junctions – a glass-mosaic and a MS grille. The house is defined by gradients. Light plays a significant role in the experience of the project as it reflects from various surfaces bringing into focus colours and textures that define the spaces. In an organic whole, the set of elements – defined by surfaces and spaces, levels and colours – come together to define architectural volumes that come to life in light. 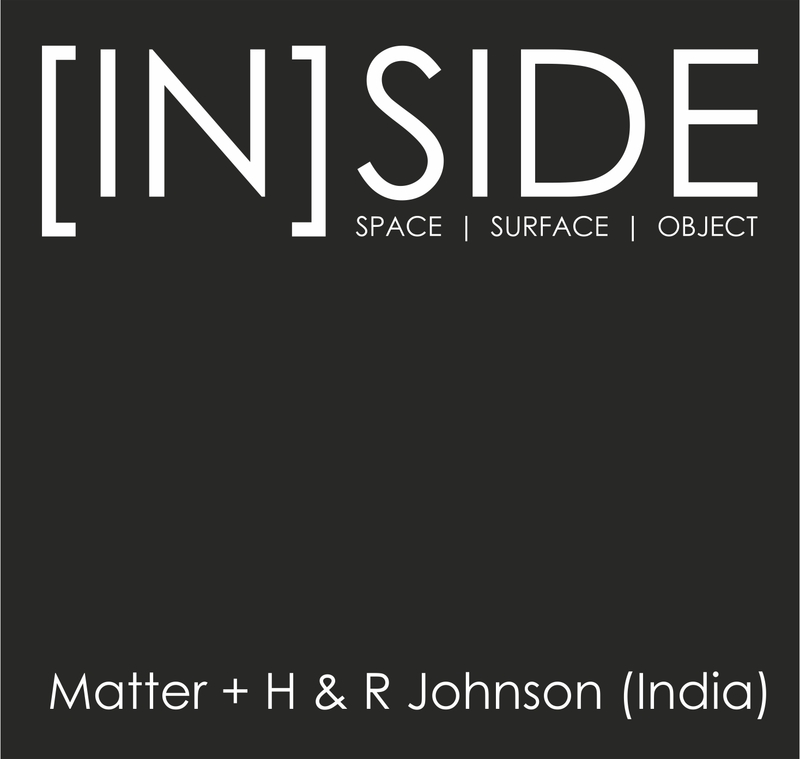 A conversation between Prashant Dupare of iSTUDIO architecture and Ruturaj Parikh of Matter. on The Brick House. RP. 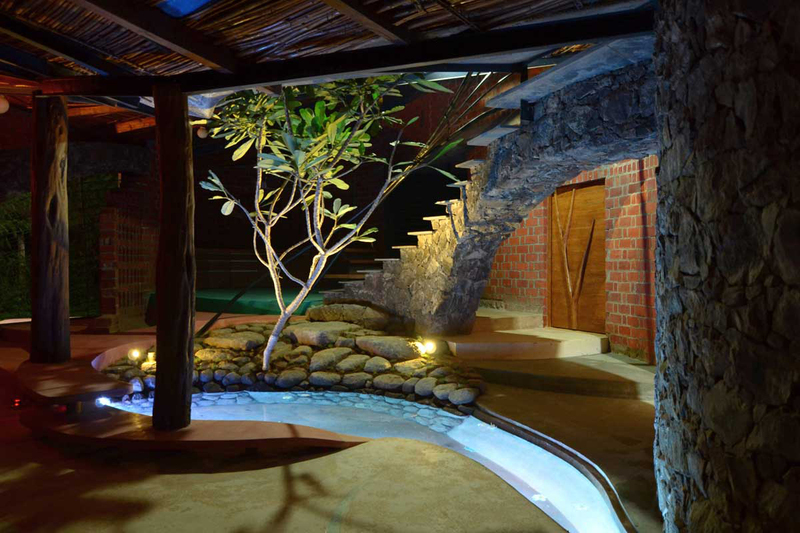 Coming to the design of the building, there is an affinity towards the ‘organic’ in your work – fluid and open. What is the process of design in your studio? Do you work with many computer models? PD. We engage with the site, the client’s sense of aesthetics, the possibilities of forms suiting the site. We are three partners, who argue over each design. We are quite different in our design sense and bring to the table, separate points of view on the project. We sit together when the project work is to start, figure out the site, the programme and the client, the conceptual direction we want to take the project in, after a lot of debate and then proceed ahead with options along those conceptual lines. We work with 3D models, physical models, sketches and 2D drawings. It depends on the complexity and the physical form of the design. There are times when the partner handling a particular project, is stuck with design or execution. He / she comes back to the table and we discuss it again. So the design goes back and forth throughout the project. Construction of a curved wall in rat-trap bond. RP. There are many materials you have experimented with. Is this a typical palette in your work? PD. It depends on the form of the structure and local materials available. Each form calls for a particular material and can be achieved with that material only. We often contrast natural stone or exposed brick work with concrete or painted surface. The contrast of texture achieved through this is stunning and brings out the properties of various materials. RP. What was the most challenging aspect of the project? PD. The evolution of spaces. Each individual space had to juxtapose perfectly to the next. It needed to flow into the next space flawlessly. We took a long time over the planning of spaces. But once the plan was finalised, we needed to modify it very little. 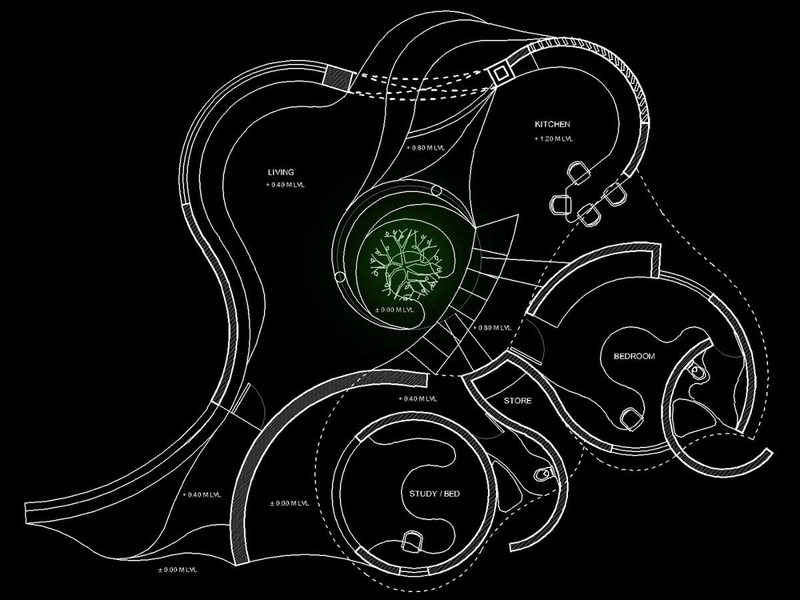 The visualisation of spaces was very intuitive and inspiration would strike after continuously mulling over an idea. This three-dimensional revelation of ideas between the three partners, was a process which involved models, sketches, debates, drawings (not too many) and onsite trials and errors. It was a challenge to formulate and convey each space to each other as well as to the contractors. RP. From your work, it is evident that you have a good passion for detail. Tell us about your previous work…Who are your masters and mentors? RP. Materials – you have been influenced by the work of Laurie Baker. What prompted you to select this palette (exposed brickwork, ferrocement, stone, oxide etc.) for the house? PD. The client is a very simple man with a rural background. He had come to the city after spending an idyllic childhood in his village. For him, the memory of his home was a simple brick structure with a verandah, where he spent his time playing and his mother cooking inside the house. We decided to experiment with exposed brickwork with his memory as our base. The palette of materials is very local and placed so as to set off the contrast in each other. RP. The brickwork is done in rat-trap bonds. Was it difficult to work in a curve with this mechanism? How did you achieve a curve in this bond? PD. Once the basics of rat-trap bond masonry are understood, achieving it in curved form was matter of some experimental mock-ups. In rat trap bond, bricks are placed in vertical position instead of conventional horizontal position and thus creating a cavity (hollow space) within the wall. Rest of construction method remains same as any other conventional brick masonry. Curve is achieved by varying the gaps between bricks in outer and internal face. 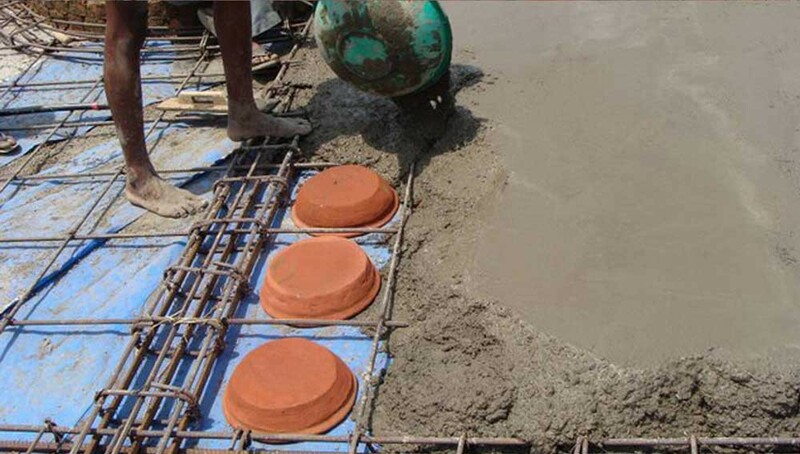 Pouring concrete for the filler-slab around inverted earthen pots. RP. A house like this must be very difficult to secure. How does the enclosure work? Was it difficult to close irregular openings? PD. Yes, securing the house was challenging. We had to come up with unique design solutions because of irregular shaped openings. Since the client wanted a house which opens out to surroundings, we did not have to completely enclose all openings, especially in the family area. So, we designed metal grilles which follow the language of the house and ensure safety. Wooden louvered shutters are used for bedroom windows which ensure safety and provide flexibility regarding light, ventilation and privacy. Main door is made of wooden planks which are tiled at differing angles so that it fits in place and merge the flow of adjoining walls and roof. RP. Tell us about the roof – how was it modeled? What were the challenges? For more information on the Rat-Trap Bond, visit iSTUDIO’s website here: RAT – TRAP BOND PAGE.